Honorees included Manchester Lions Club, Dylan Burroughs, Carolyn Van Horne, Callie Fournier. 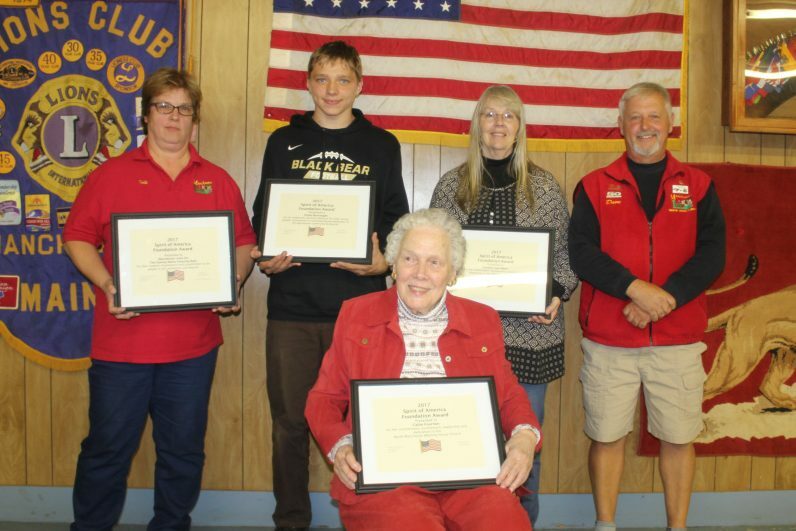 The Manchester Lions hosted its annual awards recognition ceremony of the local chapter of the Spirit of America. Awards were presented for the Youth, Adult, Senior and Special Project categories, according to a news release from Diana Worthing. Lion Deb Maddox, immediate past president of the Manchester Lions Club, accepted the Spirit of America Recognition award for the club for its volunteerism efforts in helping defray the cost of glasses for a community member. The Manchester Lions Club was the recipient of the Project Award for The Central Maine Amazing Race, which was a testimony of volunteerism by most members of the club who participated. The club raised more than $ 7,400 to help purchase a pair of specialized glasses for a lady in the community, who had some vision but had only been able to see blurred images for 17 years, according to the release. Dylan Burroughs, a Maranacook Community School student, is involved with the Interact Club at the school, volunteered for Salvation Army bell ringing, a member of the school’s Chamber Chorus as well as a varsity football team member. He also is an active member of Manchester Community Church and youth group, participating in many activities including fundraising for the Travis Mills Foundation, according to the release. Carolyn Van Horne has immersed herself in the world of volunteering. She is the president of the Manchester Historical Society, where she has spear headed multiple projects. Van Horne is a member of the Manchester Grange, recently elected master, a deacon of the North Manchester Meeting House Church and is treasurer of the North Manchester Meeting House Association. She is a leader with a positive attitude who accomplishes the many goals that she sets, according to the release. Callie Fournier has served as treasurer for many years at the North Manchester Meeting House Church. Fournier donated many hours visiting those that have a hard time getting out. She has taken meals to those that are in need. She has always gone above and beyond what was expected of her. Her dedication to this little church and to her community will always be a great example and inspiration for all, according to the release.